Although many people are still celebrating summer, the school year is starting soon. Many parents are gearing up for the costs associated with school supplies, which seem to go up every year. According to a 2014 Today News article, the average parent will spend $100 on school supplies for each K-12 student, up 12% from 2013. For families with more than one child, this cost can seriously impact their budget. Try some of the following tips to save money on school supplies for the upcoming school year. After the school year ends, many children bring their leftover supplies home and forget about them in backpacks, closets, and the family office. Before the school year starts, and before you open your wallet, gather all of your supplies together and sort out what you have. Some places you should look besides the above include old storage containers, desk drawers, and filing cabinets. You’ll be surprised how many folders, notebooks, pencils, and pens you might find! Do you know some families with children either younger or older than yours? Now’s a great time to partner up and trade supplies. Compare your school supply list with what they have and trade items you no longer need for items they will, and vice versa. Not only do you save money, but the other family saves money, too. If you still need supplies, it’s a good idea to set a budget and take cash out for specific costs associated with the school year. Using an envelope of cash also allows you to keep your spending down since you see the physical amount of money you have. You’ll avoid the overspending that often happens with debit or credit cards. The best part of using an envelope system for your school supply shopping? If you have any extra money left over, you can put it towards savings goals or paying off debt. Rather than paying the full retail price for school supplies, look at some weekend garage sales and thrift stores for lower priced items. You can even try and negotiate a little bit to drop the price. Taking cash – Many places are cash-only, and cash will strengthen your bargaining power. Shop often – If you don’t find good deals one day, make sure you go back again another day to see if there are new deals. Ask about store policies – You might not be able to haggle, and every store has different policies on sales and discounts, so make sure you get the scoop when you shop. Buy items at off-peak times – When it comes to buying school supplies, you might have a better time purchasing them at a thrift store when the school session is in full swing, rather than at the most popular purchasing times. Be prepared to travel for the best deals – Rather than searching only thrift stores in your area, make sure you venture to other neighborhoods and nearby towns to find the best deals and variety of items. The reason so many school supplies are costly is because of brand names and designs. However, if you’re on a budget and can’t afford all of the bells and whistles, the dollar store will have the standard supplies you need without hurting your wallet. While not available in every state, some counties participate in tax-free holidays right before the school year. Check if there’s one near you online or in a nearby state. The taxes may not make a huge dent in your school supply budget, but if you have a larger amount to buy, it’s worth it. You can even purchase electronics during the tax free holiday and receive a substantial discount due to the slashed cost of taxes. Does your child need a large number of notebooks or lined paper for school? Go to a big-box store or warehouse and buy the supplies there to save some money. Rather than buying smaller quantities of supplies, purchase a bigger quantity to save money later. Another bonus: you’ll be able to use the supplies later when your child runs out. No need to make emergency runs to the store – you already have supplies! As with many creative savings methods, using coupons for your school supply shopping is a good way to avoid breaking the bank. Many manufacturers offer coupons, and some can be combined with coupons specific to the retailer. Make sure you read the fine print, though. Some coupons have restrictions, and ever since the coupon clipping craze swept the nation, many retailers have been cracking down with their own limits on quantities and combinations. Finally, with a little planning, you might save money on school supplies buying them right after the peak buying season. In the fall, for example, you might want to wait to buy them in September or October when items are on clearance. This may not be ideal for the start of the school year, but if there are supplies you can wait to get, it may be worth it. Just because other people are breaking the bank on school supplies doesn’t mean you have to. With a little planning and foresight, you can fulfill the full list of supplies your children’s teachers want while still keeping your budget in check. 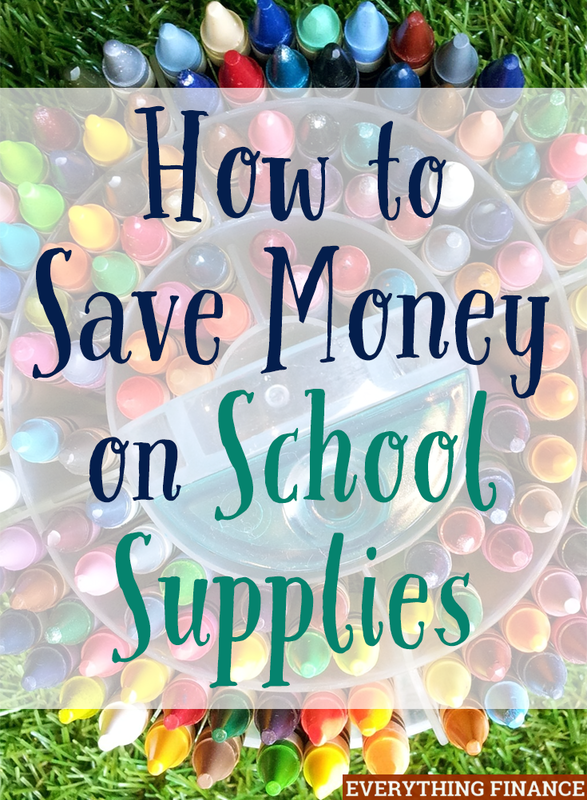 What other tips do you have to save money on school supplies? Share your ideas in the comments! Existing supplies are items most forget about. You likely don’t need a new backpack each year. Last years three-ring binder may still work. Those subject notebooks or composition notebooks can easily be reused, just remove the pages you used last year. Eliminate unnecessary buys by going through what you have leftover from last school year. My tip: Avoid licensed items. Don’t buy mechanical pencils that have your favorite Disney character on the side, stick to the plain designs. Anything that has a licensed graphic will likely be a premium buy.